Explanation: Sprawling across hundreds of light-years, emission nebula IC 1805 is a mix of glowing interstellar gas and dark dust clouds. 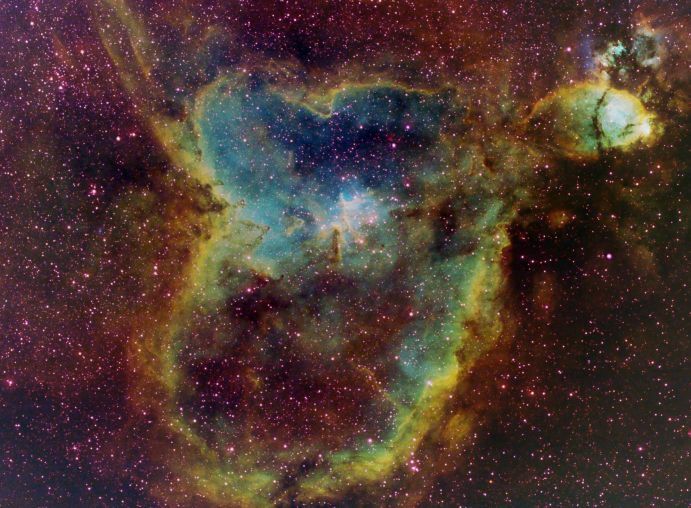 Only about 7,500 light-years away, stars were born in this region whose nickname - the Heart Nebula - derives from its suggestive shape (seen here sideways). This gorgeous, deep telescopic image of the nebula is very colorful, but if you could travel there and gaze across these cosmic clouds with your own eyes, are those the colors you would really see? The short answer is no, even though the image was made with light visible to the human eye. Light from this and other glowing gas clouds surrounding hot, young stars comes in very narrow bands of emission characteristic of energized atoms within the clouds. In fact, the nebular glow is often dominated by hydrogen atoms emitting light in only a small fraction of that broad region of the spectrum that we see as the color red. 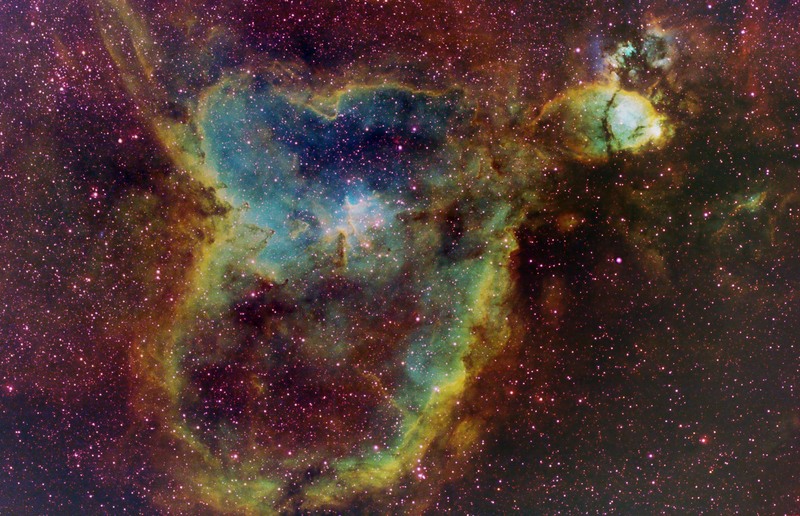 Adopting an artificial color scheme commonly used for narrow band images of emission nebulae, this beautifully detailed view shows the light from sulfur atoms in red hues, with hydrogen in green, and oxygen atoms in blue.